Sat May 4, anytime from 10-2pm! Join the fun and decorate a pot for Mom and/or Grandmom on Saturday May 4! Come check out the FIRE TRUCK that will be visiting in the morning! Also come and enjoy some popcorn, snow cones and worms with your friends and family! All ages are welcome and the fun begins at 10am and participants may come and go as they please until the event ends at 2pm. 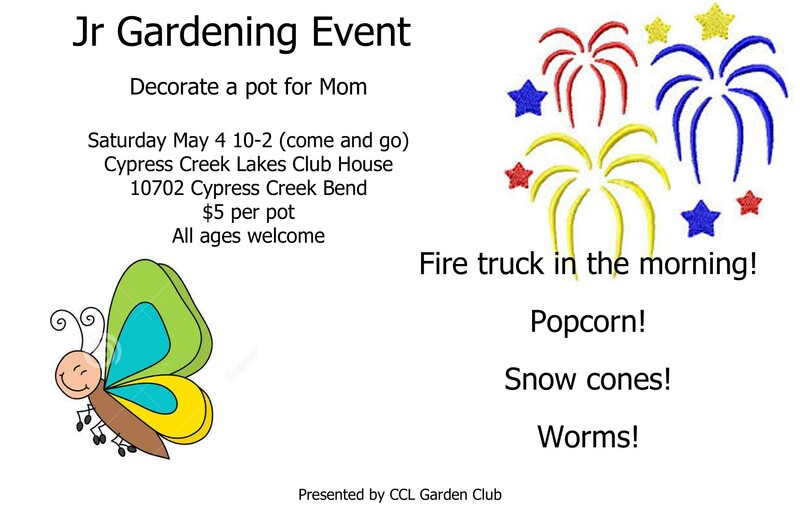 Only $5 per pot, so plan to stop by the Phase 2 Recreation Center (10702 Cypress Creek Bend) and decorate a gift Mom will treasure on Mother's Day, see you there! !